In the seventies SÄBU set new standards with the FLADAFI® Material Container. 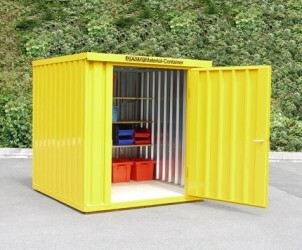 FLADAFI®, the first dismountable, completely galvanised storage container on the European market. Today, FLADAFI® is associated with a fully developed and unique room and storage range, persistence and a large range of equipment for almost each field of application. Besides the non-insulated single containers and container combinations the FLADAFI® range also includes insulated storage containers and combinations for practice-oriented material storage. The roller shutter containers with aluminium roller shutters and the shelving containers with folding doors offer lockable storage facilities also with limited space available. Storage and tool boxes are the optimal completion for the secure storage of small quantities. SÄBU attaches great importance to customer satisfaction. Quality, professional competence and service have a high priority. We competently and comprehensively advise you on questions regarding your individual requirements.